Enhance your mobile digital experiences outside the home with our Pavilion dv2700t Broadband Wireless Notebook PC: A 14.1", 5.3 lb. notebook that packs Centrino technology with the convenience of BroadbandAccess built in. With the freedom and power of WWAN technology, you'll be able to get connected and go on the Web from more places at home and on the go. This notebook features BroadbandAccess coupled with powerful 64-bit Core 2 Duo processors. With two execution cores on a single chip, it can run multiple multimedia applications without slowing down your system. You'll enjoy enhanced games, digital music, digital photography, and video editing, and you'll get significantly improved performance when running multiple apps. The Pavilion dv2700t Broadband Wireless Notebook sports our latest Imprint finish?a polished, piano-black coating with our subtle "Radiance" pattern. The case is sturdy and designed to survive rough handling. The design incorporates latch-free closure, and touch-technology media launch buttons. Goodbye multiple passwords. Simply swipe your finger across the optional integrated reader on the side of the panel to log on to your dv2700t and to password-protected Web sites and documents. Stay in touch with friends and family using the included integrated low-light VGA webcam and two omni-directional microphones. The 14.1" high-definition BrightView widescreen lets you view 4 percent more on your screen than the 14" display, and the 16:10 aspect ratio easily positions two pages side by side. You'll get best-in-class video for games and multimedia with the Nvidia GeForce 8400M GS graphics card (64MB dedicated video memory). High-quality audio is supplied by integrated Altec-Lansing stereo speakers, and you can choose two sets of stereo earbud headphones so you and a friend can enjoy music without disturbing others. The integrated HDMI port (with discrete graphics option only) lets you view high-definition content on your HDTV (cable sold separately). The Pavilion dv2700t-Broadband Wireless features the latest version of HP QuickPlay 3.6, which launches DVDs, music, and photos at the touch of a button. An included remote, which stores in the ExpressCard slot, gives you control from up to 10 feet away. Transfer photos from your digital camera to the dv2700t via the 5-in-1 digital media card reader, then use our Photosmart Premier software to help with photo editing, printing, organizing, sharing, and storing. You can turn pictures into movies, edit video, and create CDs and DVDs. Added bonus: burn your own, silkscreen-quality, laser-etched labels on discs when you can choose the LightScribe option on the SuperMulti DVD+/RW/R drive. Use the HP xb3000 Notebook Expansion Base (sold separately) to easily connect the dv2700t Broadband Wireless Notebook PC to your peripherals, including a monitor, for a true desktop experience. Other ports include two USB 2.0, an ExpressCard/54, an RJ-11, an RJ-45, an IEEE 1394 FireWire, an S-Video, and a consumer IR. Get connected in more places, without having to hunt for hotspots, with the standard integrated HP Broadband Wireless card supported by Verizon BroadbandAccess service. 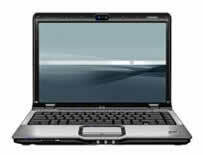 This page is part of GeneralManual.Com Network HP Pavilion dv2700t Broadband Wireless series Notebook PC User Manual.